The Rebel Sweetheart. : Spazz Saturday #1 | Jin Yi Han. Take note of the possessive noun. Kiseop is mine, haha! She went on to post a few more photos - Eli (again! ), then TOP, and finally Jaejoong. Likewise, I was doing some fangirling of my own. My Big Bang Greatest Hits DVD was playing as I cleaned the house, and I was posting photos of TOP, Yoochun, and Jin YiHan in between chores. Currently spazzing on Jin Yi Han! I almost gave up watching #thisstupiddrama Time Slip Dr. Jin if not for him. I'm now halfway through his 2012 drama 'Happiness in the Wind', which has 173 episodes. Inspiration struck me in the midst of this spazzing, hence, the birth of this new meme. I've been wanting to start a meme in this blog for the longest time, I just had no clue as to what the meme should be about. Thanks to Marge and these pretty Korean boys, I give you Spazz Saturday! 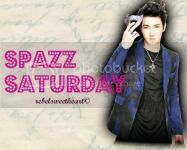 spazz - (1). A reaction to something crazy or weird. (2). Another word for "freak out". What's making you spazz this week? Share your blog posts/photos in the linky below! Just to make it clear, Spazz Saturday is not limited to Kpop/Kdrama/Korean actors. Your post could be about Hollywood actors, a British boyband, a movie, a restaurant, a pair of shoes... heck, it could even be about Chuck Norris! Whatever it is that's making you giggly and giddy right now, that's it! Eh anak ng tipaklong sa talahib yang eli eh...has he not heard of this new invention called the jock strap...kalerkee! i'm not a real fan of big bang more of siwon.